You’ve a Christmas tree in the living room, you’ve strung lights and hung cards, and you’ve decked the halls with boughs of holly. But do you decorate your bathroom for Christmas? Here are a few festive tips for the room that’s often overlooked during the holidays. All of the images below were found on Pinterest, where we routinely share pictures of the most beautiful bathrooms in the world. Full-sized sets of fairy lights won’t work in the bathroom. There’s no plug sockets and, apart from anything else, they’d present a fire hazard. But you can get small sets of battery-powered LED lights. It’s best to keep them away from water, but why not arrange them around the window, or the mirror? You could also put them in a mason jar, which you can safely place on almost any surface. We’ve been scouring Pinterest for beautiful bathrooms for some time now. A major trend we’ve noticed is the use of stark tree branches in bathroom design. It’s a striking modern look, but adding a piece of nature to your bathroom can also add a touch of rustic earthiness. In any case, there’s no reason at all why you can’t treat this bathroom tree branch as a minimalist Christmas tree. A few baubles, tastefully arranged, could work wonders. Never mind Christmas lights – how about Christmas spice? Add the perfect fragrance to your bathroom with a Christmas room diffuser or scented candle. From Fir Tree to Christmas spices, many scents will help transform your bathroom into a winter wonderland. Or if you want a more bathroom-appropriate scent, go for dried pine. Get some Christmas hand soap or shower gel especially for the season. Or better yet, a festive set of Christmas towels and dressing gowns. It’s one of the biggest secrets in bathroom design: Neutral colours can act as a blank canvas. You can use movable items like towels and bath mats to add a distinctive splash of colour that can quite easily change with the seasons. For Christmas? Go for shades of red, green and gold. Do You Want a New Bathroom For Christmas? Even if you’ve no intention of decorating your bathroom for Christmas, perhaps a new bathroom is at the top of your Christmas list? Or maybe it’s a project you have planned for next year. In any case, we’ve got quite the Christmas present for you: Our shower cubicles can revitalise your bathroom in a matter of hours, with no hassle and very little mess. Even better: They require no tiles, grouting, silicone, or sealant. That means that they never leak, and they never get mouldy. 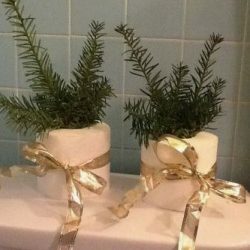 So our Christmas present to you: A chance to completely transform your bathroom in less time than you thought possible. For more information about how we can revolutionise your bathroom, and a free quote, get in touch. Merry Christmas, Season’s Greetings, and a Happy New Year from All of Us at Kinedo!